THE proposed $600,000 Springvale Asian Gateway project has become the subject of a heated community row. 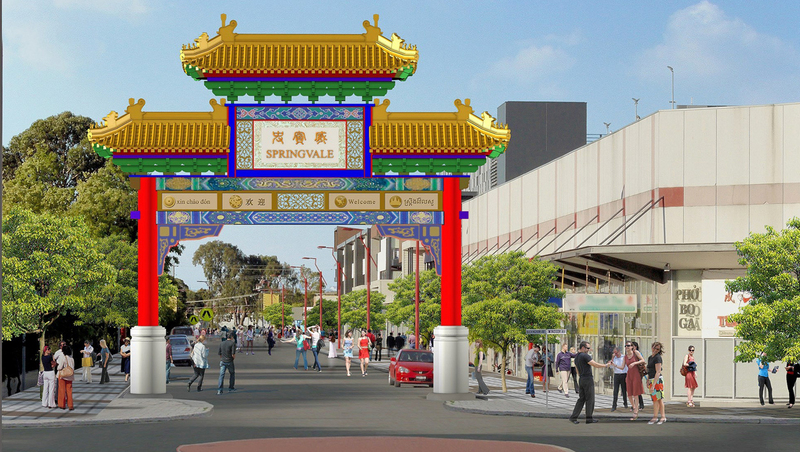 gateway to Springvale’s shopping centre for being too Chinese in style. Chinese calligraphy above the word Springvale in English. However, the Chinese community says the design is in line with other Asian gateways around the world. The Springvale Asian Business Association (SABA), which is contributing $200,000 to the project, has backed the design. SABA spokesman Mr Stan Chang said the proposed design represented a long-held Asian tradition. Asian country, whether it’s Japan, Vietnam or Thailand,” he said. Greater Dandenong councillor Loi Truong called for the Chinese calligraphy to be removed from the top of the design. “The gateway is supposed to be Asian, not Chinese,” he said. Vietnam, Cambodia, China and Australia. residents were born in Vietnam than in China. The potential division in the Asian community arose after Greater Dandenong council invited comment on the design. Chinese, Vietnamese and Cambodian communities”. South East Melbourne Vietnamese Association’s council has offered to donate $100,000 towards the project to have its say. Spokesman Trung Doan said the association didn’t accept the Chinese-style gateway was an Asia-wide tradition. “There are gateways in Vietnam with Vietnamese writing on them,” he said. issue during last year’s council elections. Councillor Sean O’Reilly said Springvale’s hallmark was its tolerance for other cultures.